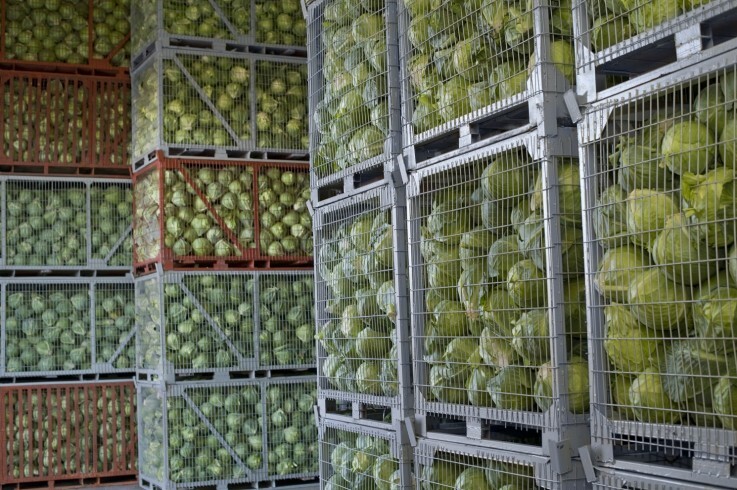 Food, pharmaceutical and consumer products companies up and down the country are struggling to find suitable storage facilities as a direct result of the ambiguity surrounding Brexit. It was reported earlier in the year that more than 75% of UK warehouses were completely full, with associated costs soaring by as much as a quarter. Since then, the situation has worsened to the extent that purpose-built storage spaces are now completely unavailable, necessitating that alternatives are found – and quickly. The narrative of storage scarcity coincides with an increasing demand for so-called Brexit ‘survival kits’ that would supposedly keep the average person fed and watered for 30 days. It is clear that Britain’s withdrawal from the European Union has affected business confidence in some industries, with thousands of retailers purported to be preparing for a worst-case scenario. In January, the government pledged to spend around £1m on refrigerated storage for medicine stockpiles in the event of a no-deal Brexit. According to Stephen Hammond, minister of state for health and social care, a contract originally tendered in October 2018 has now been signed providing capacity for 53,000 pallets of ambient storage, 5,000 pallets of refrigerated storage and 850 pallets of controlled-drug storage. But a huge shortfall of space has prompted many companies to seek other solutions, with some even adopting an ‘Airbnb of warehousing’ approach whereby unoccupied areas are rented out as a short-term stopgap. Converting otherwise empty rooms or buildings into temporary storage facilities is becoming increasingly common with space now very much at a premium, but this practice is something that Andrews Sykes have been helping customers with for many years. As the UK’s largest specialist hire company, we have the ability to offer clients the most appropriate climate control equipment for their storage application regardless of its use. We understand that requirements differ from business to business and our aptitude for providing temporary heating, cooling and dehumidification equipment is based on many years of experience. • Before trying to source any climate control equipment for your application, you should consult a climate control expert who will survey your facility and accurately calculate the dimensions of the area requiring cooling, heating or dehumidification. • Keep your premises clean and wipe any spillages or leaks immediately. This will reduce the likelihood of Listeria bacteria growing and prevent drips from thawing meat spreading bacteria from one piece of food to another. • Keep food and medical goods sealed at all times. Store refrigerated foods in covered containers and check for spoilage every 24 hours. • Always use pallets to prevent food from coming into contact with the floor. • Make sure you differentiate between products requiring dry storage, refrigerated or chilled storage and frozen or cold storage. Different foods require a different storage environment. • Ensure buildings are kept as insulated as possible by keeping doors, windows and other openings closed. • Frozen foods are stored at a minimum of -18°C. • Dry foods or products are kept between 10°C and 20°C. • Any area in which food or temperature-sensitive products are being stored should have thermometers present for hourly checks. This should be recorded in a log book in line with health and safety regulations. • The level of relative humidity in a dry storage space should not exceed 15%. • Never store food or pharmaceutical goods in direct sunlight. • Ensure you adopt a ‘first in, first out’ approach to storage and distribution. • Holes in windows, walls or open doorways. • Roof leaks or loose foundations that increase the chances of water ingress and dampness. • The use of pesticides or other chemicals that could be harmful to meat or produce. • Standing water or the presence of rubbish bins. When assessing the area of an application that needs to be controlled, you should consider the total volume of the area and deduct the volume taken by the products being stored. Once this has been calculated, a simple rule of thumb would be to allow around 60W of cooling or heating per cubic metre based on the building being well-insulated. Where humidity is the critical factor, single units can keep dry areas of up to 20,000m³ and remove in excess of 1,500 litres of moisture every 24 hours. In many cases, the use of multiple smaller units may be considered a more convenient solution due to greater flexibility being afforded. For these reasons, we strongly recommend having a full site survey conducted by an experienced technician. Unlike companies elsewhere, Andrews Sykes offer clients free site surveys prior to any agreement in order to decipher the best course of action for your unique project. The sensitivity of pharmaceutical products means it is imperative that they are appropriately stored, with tablets, capsules and powders particularly vulnerable to humidity and absorbing moisture. In such scenarios, the safest and most effective way of stockpiling said products is by using dehumidifier units to maintain a desirable level of relative humidity. Our range of reliable desiccant dehumidifiers produce very low levels of RH and have been designed with the pharmaceutical and food & beverage industries in mind. 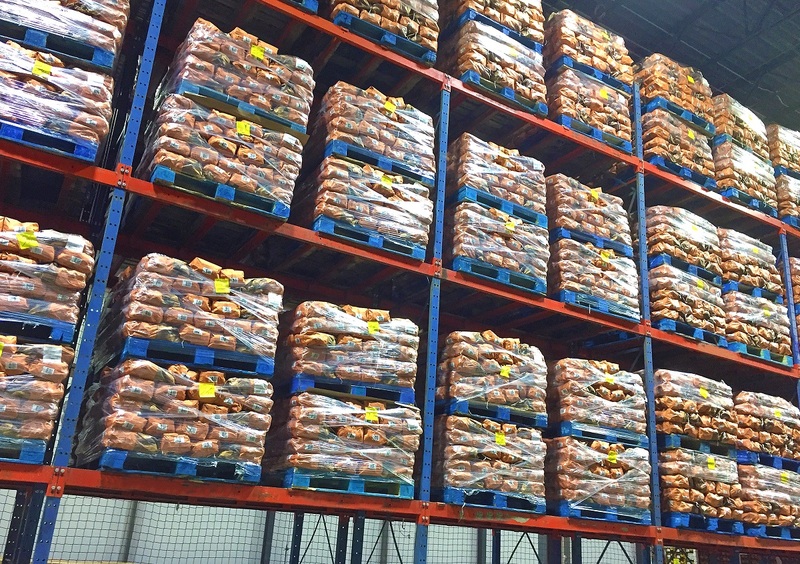 We are also proficient in converting areas into low temperature storage applications – particularly in instances where food is being warehoused. Storing nutritional products at low temperatures prevent the growth of microorganisms and the likelihood of chemical reactions. Our Fast Chill range and low temperature fluid units are therefore perfect for projects of this nature and can reduce temperatures to as low as -15°C. With warehouses and designated storage space no longer readily available, we can use our industry knowledge and equipment to maximise storage capacity by transforming unused areas into additional depositories. During the heatwave of 2018, Andrews Chiller Hire was approached by a large family-owned farming and dairy enterprise based in the South West. The company in question is known as one of the UK’s biggest producers of organic foodstuffs, exceeding 2,000 tonnes every single week. When high seasonal temperatures threatened to spoil vast quantities of freshly picked fruit, a decision was taken to source a climate control solution that could cool the substantially sized warehouses in which the products were kept. In order to prevent the decaying of fruits and other perishables, the customer specifically requested that a temperature of 16°C be maintained inside three separate warehouses. As a result, three 100kW fluid chillers were deployed outside the target areas, with each unit connected to two 50kW air handlers situated inside. This is just one example of the countless projects in which Andrews have helped adjust the temperature of an application for the benefit of goods stored inside. And while chilled storage is probably the most common requirement on a day-to-day basis, there is also great demand for both heating and humidity-related solutions. From a storage perspective, cold winter temperatures can be just as problematical as excessive warmth and so a quick remedy is essential if the mercury plummets. 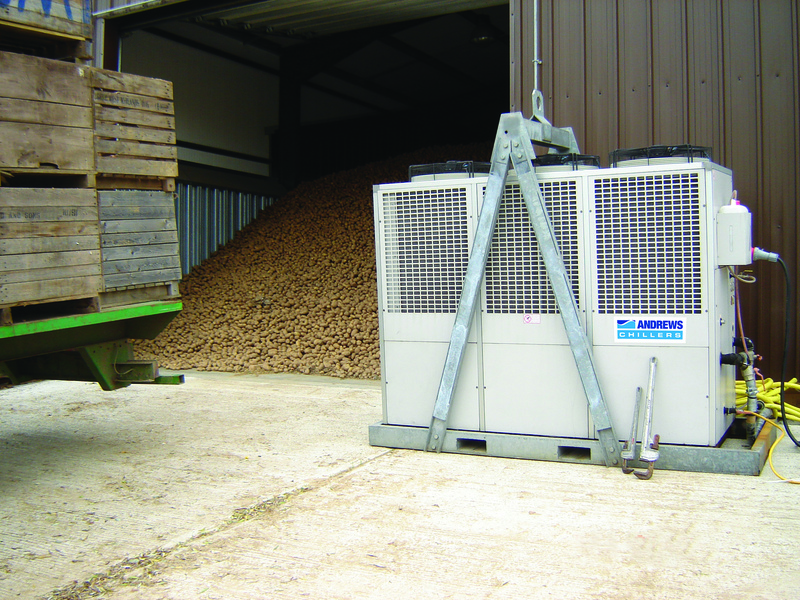 When freezing conditions threatened to affect the country’s largest supplier of potatoes, a hired heating solution was needed to protect the yield prior to sale. Our client was concerned about the ambient temperature of their storage warehouses and stipulated that we maintain an 8°C thermometer reading to safeguard product quality. Having assessed the dimensions of the property, it was decided that two high capacity FH4000 oil fired heaters would be deployed at opposite ends of the building and fitted with thermostats to maximise fuel efficiency. These units were operational 24/7, while previously identified ‘cold spots’ reaped the benefit of recirculation ducting to ensure that volumes of warm air were evenly distributed throughout the premises. As a result of our intervention, a client’s previously vulnerable potato stock was protected without any further issue and stored safely on site before being delivered to retailers. Carl Webb, UK HVAC & Specialist Hire Sales Director at Andrews Sykes, explains: “Failing to take the appropriate measures when storing things like produce, sugar and pharmaceuticals can cost businesses big money, so it’s very important that you consult an expert at the earliest possible stage. “The current political and economic climate has completely decimated the availability of conventional storage facilities, and there’s not a lot we can do about that. What we can do, however, is help companies transform vacant buildings, barns, and factories into practical temporary storage facilities. “Andrews Sykes has got a proven track record of providing temporary climate control equipment to areas that might not normally be used for stowing food and medicines, among other things. Our engineers understand the implications of a poorly maintained temperature or environment and the many knock-on effects of this. This article was posted in Andrews Air Conditioning, Dehumidifier Hire, Heater Hire, News and tagged Brexit, Climate control, HVAC, Storage facilities, warehousing. Both comments and trackbacks are closed.